Who is the better pokemon champion of the gems series? I choose Steven, as he has a better variety of Pokemon and is better fit to be the Champion. Yeah, Stevens cradily could kill off most of Wallace anyways, and the both have Milotic. Really? I would think Wallace is better. Sure, I think Steven is way awesome as much as the next guy, but Water VS Rock, Steel, and Ground is not a great match up. Ice Beam kills Cradily and Earthquakes murder Aggron and Metagross. Skarmory poses no offensive threat whatsoever. I was thinking more torwards a random trainer, but now that you've explained that too me, it makes sense. They are probably around the same when it comes to battling just the average trainer, although Steven and Wallace both have their own advantages. So I guess I can't necessarily say who is "better" as Rock/Ground/Steel is a completely different type than Water. I had awful memories when I first fought Milotic. My super-effective Pokemon was down and I was out of revives and this Milotic kept using Recover for like 6 times in a row when on low HP until I finally got a critical. I was like "Oh my god, just die..." the whole entire time. Milotic was his last and Slaking was my last. 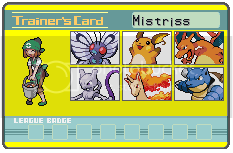 I had Thunderbolt, but it was super weak and the stupid Truant made me want to jump into the game with a shotgun and shoot Milotic. I finally figured out Slash did much more damage. I can't trust any Fire type in RSE except Blaziken and Ninetales. So I usually get Blaziken and one Blaze Kick completely destroys Metagross. And I seee why Purple is your fav color... Ambipom FTW. And I seee why Purple is your fav color... Ambipom FTW. YES, YES, YES! THANK you. Someone who understands! steven cuz he died for pokemon. Their both pretty good in their own way, but Imma have to go with Wallace just b/c of the fact that I have to make a better moveset with my pokemon just to fight extreme water again. Mainly b/c I don't really use electric and grass types often. Wallace wasn't that difficult for me considering that his whole team was based around water types, and they were pretty easy to take out. Steven's on the other hand was far more difficult because he used steel and ground types, and I couldn't just thunderbolt my way through his team, I had to think. Im not sure if it helps any, but during slakings traunt turn you could heal him with a max potion. Well steven would lose more than likely because to many of his pokes are week to water, but i like stevens pokes alote more his teem is awsome but for me steven is the easyer to beat of the two. Tough call. They're both cool in they're own way, but I prefer Steven because he has an actual personality and backstory. PS: they could both pwn Alder with just one Pokemon. We'll see them both again in Black 2/White 2 in that Ultimate Tournament for strong trainers. They should actually call it that. That would be great. Steven is better in my opinion.